Supplied with full instructions. All in all, a brilliant tool to keep in your tool box. (No, the distributor is not included). 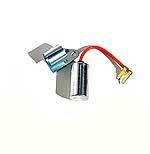 Fed up with advancing the ignition, but don't want to go the electronic route? Well now you can with this mechanical advance mechanism. In its original design, the Model A Ford did not feature a mechanism for automatic spark ignition timing (advance and retard). For optimum fuel burn energy, spark timing should be advanced between 10 to 12 degrees per thousand engine RPM. For the 2800 RPM A engine, this should be 28 to 33 degrees. This system will automatically adjust your spark by the demand on the engine RPMs. Fits on all Model A and B engines. The external appearance remains unchanged. 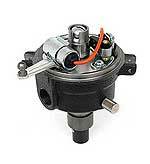 Its simple installation requires absolutely no modifications to the distributor, engine or timing procedures. 1928-31 New Original Style Distributor. Constructed with all new components, this one has the original style points and condenser. This is a brand new Model A Ford distributor, constructed with all new components. The same new distributor housing is used, but this one has the modern style upper plate with modern points and condenser, plus the wireless lower plate. The FSI 12v negative earth Electronic Ignition Centrifugal Advance Distributor features the PerTronix Electronic Ignitor, includes a cloth wire conduit, and comes with a coil matched to the proper OHMs. It's full advance hits 29 degrees at 1750 rpm. Similar specification to the Zipper distributor, but with a modern cap and housing. The unit simply connects to the coil in the same wiring position. No unsightly black box to hang on the firewall, and no condenser! Please note that the original style pop-out switch cannot be used. The FSI 6v positive earth Electronic Ignition Centrifugal Advance Distributor features the PerTronix Electronic Ignitor, includes a cloth wire conduit, and comes with a coil matched to the proper OHMs. It's full advance hits 29 degrees at 1750 rpm. The 12V negative earth ZIPPER Electronic Ignition Centrifugal Advance Distributor is encased in a stock-appearing cast-iron housing and utilizes the stock Model A cap and body. A Model A distributor stuffed with centrifugal weights and spring system. When compared side-by-side to the real thing, only a small increase in height is detected. Comes with 26 to 28 degrees centrifugal advance.The unit simply connects to the coil in the same wiring position. No unsightly black box to hang on the firewall, and no condenser! Your Zipper comes with a high energy heavy duty coil, a radio suppression coil wire, a set of 4 brass spark plug connectors, a dedicated ignition wire, and of course, complete installation instructions and a trouble-shooting guide. The 6V Positive earth ZIPPER Electronic Ignition Centrifugal Advance Distributor is encased in a stock-appearing cast-iron housing and utilizes the stock Model A cap and body. A Model A distributor stuffed with centrifugal weights and spring system. When compared side-by-side to the real thing, only a small increase in height is detected. The FSI 12V negative earth Electronic Ignition Conversion Kit, featuring the PerTronix Electronic Ignitor, (replaces the upper plate parts in your stock distributor) bolts to your distributor (the lower plate is no longer needed) and the included plastic ring presses onto your cam. That's about it! The red and black wire connect to the coil and the yellow wire is for grounding (wires included). The wires are fed through a new spring conduit, included, that is very similar to the old pop-out cable, to maintain the stock appearance. Each kit comes with a coil matched to the proper OHMs. The unit simply connects to the coil in the same wiring position as your original (pop-out switch cannot be used). There is no rats nest of multiple wires or an unsightly black box to hang on the firewall. No points, no condenser! This set up is discussed in detail in our Model A Mechanics Handbook volume 2. The FSI 6V positive earth Electronic Ignition Conversion Kit, featuring the PerTronix Electronic Ignitor, (replaces the upper plate parts in your stock distributor) bolts to your distributor (the lower plate is no longer needed) and the included plastic ring presses onto your cam. That's about it! The red and black wire connect to the coil and the yellow wire is for grounding (wires included). The wires are fed through a new spring conduit, included, that is very similar to the old pop-out cable, to maintain the stock appearance. Each kit comes with a coil matched to the proper OHMs. Distributor Body 1928-34 with brass inserts for the four cylinder engine. The brass contacts were not original but they are more corrosion resistant. Distributor Body 1928-34 with steel inserts for the four cylinder engine. 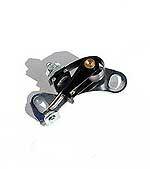 The steel inserted type is an exact copy of the original and is accurately machined where it mates to the distributor casting. Distributor Cap 1928-34. Sets on top of the distributor body and is what the coil wire plugs into. Made in USA. 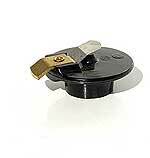 Modern distributor cap set 1928-34. Modern cap with standard spark plug wires and wire boots. Fits directly in place of the original distributor cap. Modern Distributor Cap complete with our Pertronix performance spark plug leads, for the 1928-34 Model A and Model B engine. High performance spark plug lead set for the 1928-34 model A and B engine, when using a modern distributor cap, or our FSI electronic distributor. We make these up, using Pertronix high performance leads, so get the best of both worlds with a stock looking lead together with state of the art performance from Pertronix. This is just the Modern cap from the kits above. Test for spark to the distributor and correct coil polarity (wires to the coil on the correct post). If polarity is backwards, your car will be harder to start, create uneven idle speed, have lower engine power and miss at high speeds. Install tester into top of dist. cap and start engine. At idle speed, if top light is lit, polarity is okay. If bottom light comes on, coil polarity is wrong. 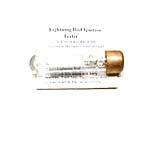 Works for 6 or 12 volt systems, negative or positive ground. Made by Nu-Rex. This handy ignition tester is great for checking to see if you have spark. With the car running, just hold against the spark plug to see if you are getting spark to the plug. Works on T's and A's. Can also be used to see if model T coils are putting out. Made in USA. Everything you need to rebuild your old distributor housing, with original style points and condenser. Modern Distributor rebuild Kit 1928-31. Just like our regular kit except this one has the modern upper plate containing modern points and condenser, plus the long-wire style lower plate. Modern Distributor rebuild Kit with modern upper and wireless lower plate 1928-31. This is the same as our modern rebuild kit except this one has the modern upper plate AND the wireless lower plate. Complete distributor hardware kit for the 1928-31 model A distributor. The screws, rivets and insulators required for rebuilding a distributor. Distributor Hardware Kit for the 1932-34 Model B distributor. The screws, rivets and insulators required for rebuilding a distributor. Stainless distributor screw & lock nut for the 1928-31 Model A Ford. Screws into the side of the head to hold distributor in place. Made in USA. 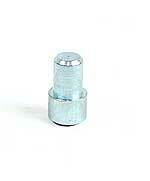 Standard finish distributor screw & lock nut for the 1928-31 Model A Ford. Distributor Heat Shield for the 1928-31 Model A Ford. 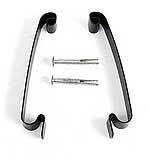 Clamps on head with head stud nuts. 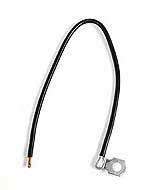 Keeps manifold heat from distributor, and helps to prevent condenser from burning out. Stainless steel. Made in USA. Distributor Index Pin 1928-31. Sticks ou the bottom of the distributor to locate the distributor on the head. Made in USA. distributor Puller for the 1928-31 Model A Ford. Distributor Housing 1928-31. A brand new casting with index pins installed, new bushings installed and reamed. You do the rest. Distributor Bushing set for the 1928-32 model A and B distributor. Press into distributor for shaft to ride in. Made in USA. 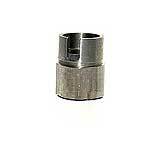 Distributor Bushing Reamer 1928-31. A quality U.S. Made spiral piloting reamer. Aligns both bushings while reaming. Not a cheap adjustable import reamer! Made in USA. Distributor Oiler 1928-31. The spring loaded nickel plated press in oiler for the distributor. You always wondered what that hole was in the side of the distributor. Made in USA. Distributor Plate Spring 1928-31. The spring fitting between the upper and lower plate. Made in USA. Distributor Clamps 1928-34 Model A and B. These are the spring clips that hold the body onto the distributor housing. Set includes brass rivets. Made in USA. Distributor Clamp Rivets 1928-31. 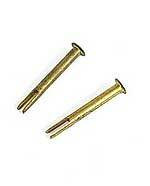 Brass rivets for holding the distributor clamps to the distributor. Made in USA. Modern upper distributor plate 1928-31. This upper plate is modified with modern Ford points and condenser. Both can easily be replaced without even removing the plate. Gets the condenser away from the extreme manifold heat, and eliminates re-timing when you have to change points. 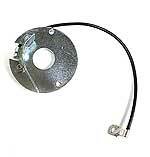 Alternatively, use the wireless lower plate A-12148-WL, which eliminates the troublesome wire altogether. 1928-31 Standard Upper Distributor Plate. An A-1 reprpduction of the original style upper plate. made in USA. Authentic in every detail down to the SP stamp. Distributor Lower Plate for the 1928-31 Model A Ford. These are made just like the original except they have a longer and modern wire. The wire makes a loop before going up to the points which takes the strain off the wire when the spark is advanced or retarded. Made in USA. Distributor Wireless Lower Plate 1928-31. By installing this modified lower plate, you will eliminate the need for the wire that runs from the points to the lower plate. 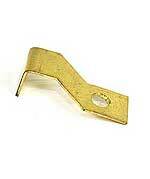 It uses a brass contact ring, and gives you a brass contact that attaches to the point stud. Made in USA. 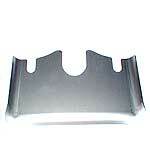 If you are using this with a modern upper plate, you will also need part number A-12148-WLM shown below. 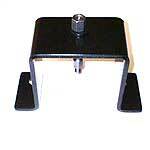 This little chap is required when using a modern upper distributor plate with a wireless lower plate. Only works with the type of wireless lower plate like we show. 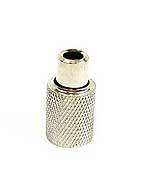 Adapter attaches with no modifications. Made in USA. Modern wire for the distributor lower plate. Will need to be cut to around 5" long. Also used on the Generator terminal post. This longer wire is required when the post is at the opposite end to the brushes. distributor Points block 1928-31. The block that holds the adjustable half of the points. This piece is not included in a new upper plate. Excellent reproduction. Not used with modern upper plate. Made in USA. The upper distributor shaft, with the added benefit of having the top of the shaft drilled, so you can oil the bushings by simply lifting the rotor and dropping oil through the center of the cam screw. Comes with cam screw and washer. Made in USA. Distributor Lower shaft for the 1928-34 model A and B engine. This is the shaft that runs from the upper shaft to the oil pump drive gear. 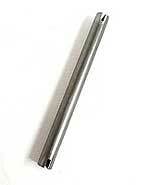 New stainless steel version of the distributor Lower shaft for the 1928-34 model A and B engine. We have seen these shafts get pretty mangled, when coolant has leaked past the head gasket and corroded the shaft. This stainless version should overcome this problem. 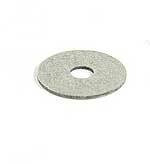 distributor Thrust washer 0.015 Thick Steel. Steel washer goes between shoulder on upper shaft and top of distributor housing. 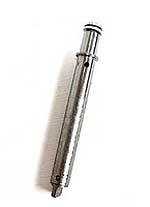 Can also be used to take up play between the shaft sleeve and bottom of distributor housing. Fibre washer goes between the shaft sleeve and bottom of distributor housing. Made in USA. 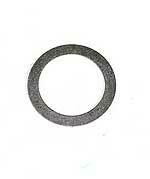 distributor Thrust washers 0.045 Thick Fibre. Steel washer goes between shoulder on upper shaft and top of distributor housing. 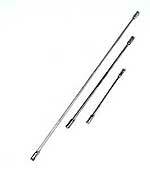 Can also be used to take up play between the shaft sleeve and bottom of distributor housing. Fibre washer goes between the shaft sleeve and bottom of distributor housing. Made in USA. 1928-31 Distributor Shaft Sleeve. This sleeve is pinned on the upper shaft at the base of the distributor to hold the shaft in place. Made in USA. Distributor shaft pin 1928-31. 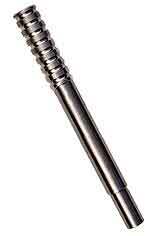 The pin that holds the sleeve onto the upper shaft. Made in USA. 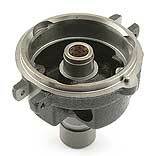 distributor Points washer 1928-31. Goes under wire terminal on lower plate wire where it attaches to points. Keeps terminal from shorting out on plate. Made in USA. Replacement points for the modern style upper distributor plate. Original style distributor points for the 1928-31 Model A. Comes complete with the contact that mounts in the point block. Not sure which points you have fitted? If you have a condenser fitted on the top plate by the points, you have the modern style top plate and will need the A-12199-MP points. Original style distributor points for the 1932-34 4 cylinder model B distributor. (Not for English Lucas distributor). 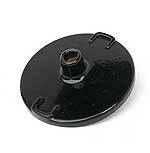 Distributor Points mounting kit 1928-31. For the original style points only. 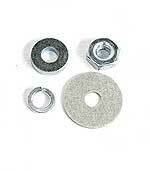 Kit contains special thick steel washer, thin insulating washer and hex nut. 1928-34 Rotor Arm for the distributor on the 4 cylinder engine. Made in USA. An excellent quality cam that has been carefully machined so timing is right on the money! Made in USA. This new style Distributor cam wrench, makes an easy job of timing the Model A Ford! Simply insert your timing pin and set to TDC, then rotate the distributor cam using this wrench until it rests against the specified contact on the distributor. Distributor Cam screw and washer. The special screw and washer that hold the cam to the shaft. The hole in the center is to lube the shaft where an oil hole has been drilled into shaft. (or when using our drilled shaft A-12178-SD). The offset style of plug connector. These were correct from June of 1930 onwards until 1934, but will fit all of the Model A and Model B. This is the condenser for the modern style upper distributor plate on the Model A Ford distributor. 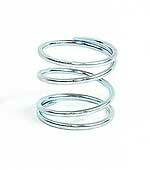 Also used on the flathead V8 when the modern coil adaptor kit is fitted. 1928-31 Condenser for the standard original style model A distributor. This is a dummy condenser that mounts in place of the original condenser to keep things looking original. These are used, if you are installing the modern style upper distributor plate and want to maintain the original appearance. Condenser for the 1932-34 4 cylinder model B distributor. 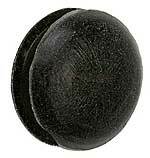 This is a custom molded plug made from urethane rubber, for an authentic look. This plug goes into the distributor in the hole where the condenser to bus bar screw goes. Originally Ford had a plug in the distributor to help seal out moisture. With this improved material this plug is reusable. Condenser screw. This is the copper 10/32 screw used to attach the condenser to the tab of the lower plate. Made in USA. Condenser washer. The copper 10/32 screw and fibre washer used to attach the condenser to the tab of the lower plate. Made in USA. Timing kit 1928-31 Complete Kit. Kit comes with everythng you see plus instructions. This kit allows you to get your timing right n the money using a timing light. Once timing is set, there is no longer any need to set timing using a pin. Also, so you can see how many degrees you are moving cam.Made in USA. "Genuine Nu-Rex". Looking for the Advance Retard Control Rods? All the control rods are in the "Carb Control" section.